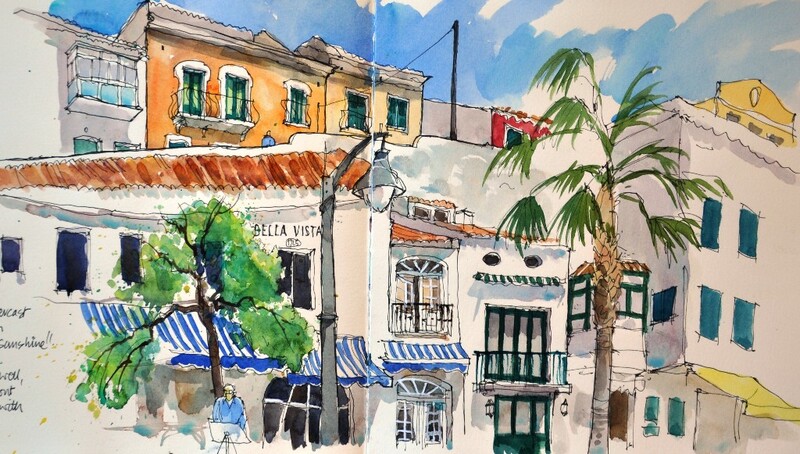 Earlier this month I took a group to the lovely island of Menorca. I had taken a group there last year and had such a good time I decided to re visit the island, this time staying in a much smaller, and quieter , hotel perched on the cliff overlooking the Mahon estuary. After consulting the forecast we decided not to go to Alcaufar today but went to the next bay round from the hotel which was Calas Fons. A lovely little harbour with lots of boats and a huge variety of small tavernas. The day started off a bit chilly but around lunch time the sun came out and it was great for the rest of the day. So much for forecasts ! Today was our artists outing where I hired a coach to take us to the other end of the island to the lovely old port of Cuitadella. The sun was out so we needed shade and Rob sought out this tiny Italian restaurant on the waters edge with great views across to the old walls and the houses on the opposite side.Our restaurant was called ' MandiMandi' and not only did they let us use their chairs and shade but also had a lovely meal there at a VERY reasonable price.They even made me a lasagna which was not on the lunch menu and Ash joined me. It was DELICIOUS ! 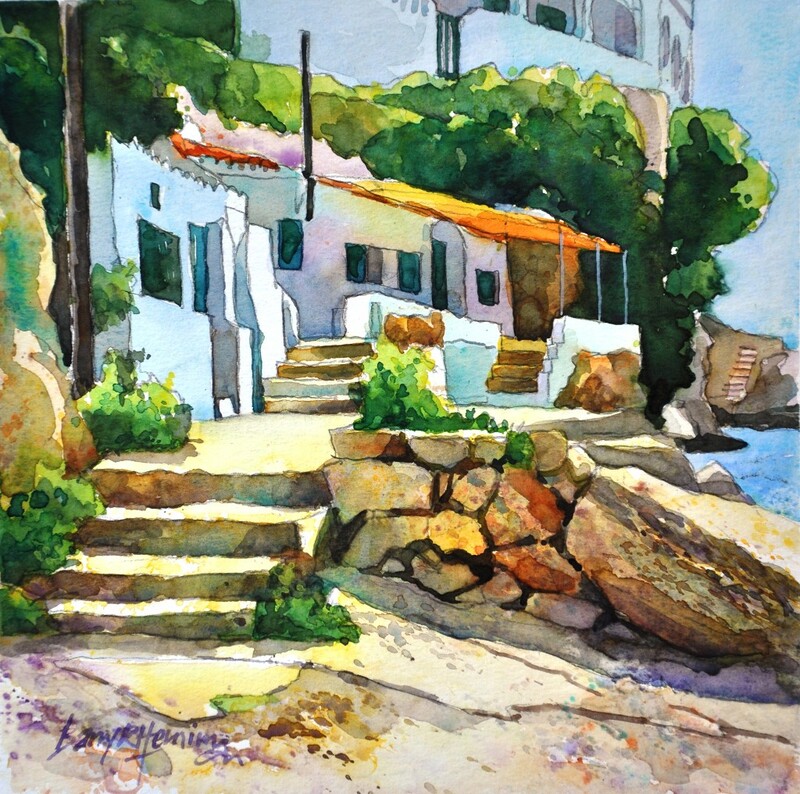 Our next painting venue was the quiet little waterside village of Alcaufar which we visited last year and were blown away by it. To quote Mollie and Sid who came here last year as well 'we always thought it was a magical place' and so it is ! We had bright sunshine all day but a little further up the coast they had torrential rain and hail and it was cold as well. But not us...magical or what !! This is a painting I did as a demo in the evening back at the hotel. Another plus for our hotel was the fact we were only a short hop on the local bus away from Mahon city centre where we spent an interesting day painting the different views afforded us by this super city . I originally went back to the small bar where we were last year but it was taken over by a much less forthcoming owner ( rather miserable in fact !) so we joined Matthew who had sought out 'higher ' ground with almost the same view and finished off the day there. So all in all it worked out rather well ! 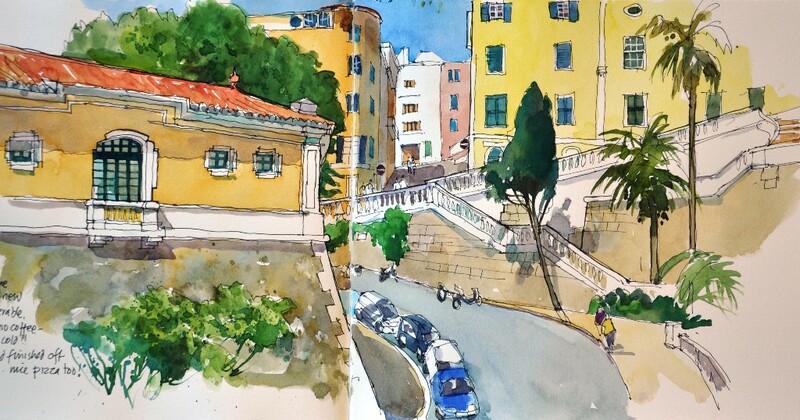 This is just a quick snapshot of our painting holiday which everyone agreed was rather special. 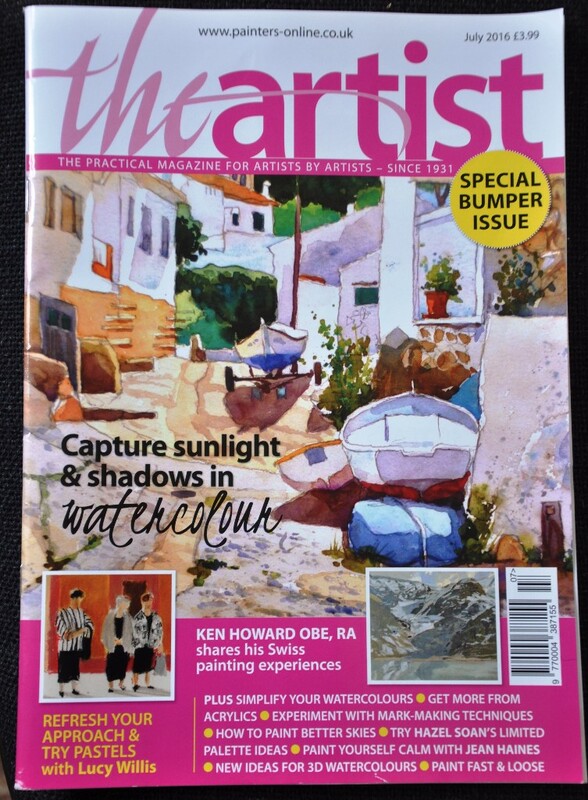 And to cap it all my article 'Sunlight and Shadows' in the July 16 issue of the ARTIST also featured last years painting of Alcaufar on the front cover.